The EZ-Dock (Model EZD-2535U3) is a single-bay Super Speed USB 3.0 to SATA Hard Drive Docking Station. The EZ-Dock 2-in-1 interface gives you the flexibility to plug-in the EZ-Dock to the USB port of your computer. Speed Speed USB 3.0 connection offers maximum data transfer rate of 5 Gbps. 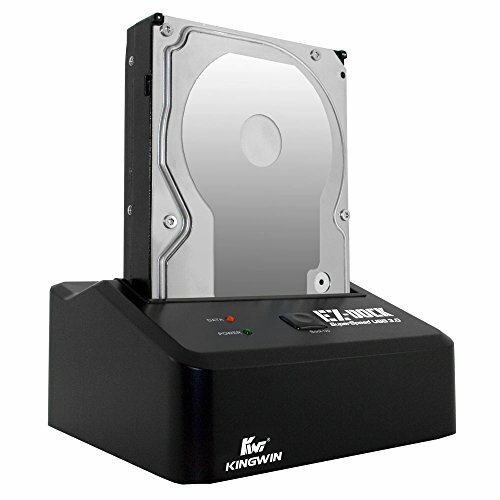 The EZ-Dock SATA drive top-loading bay supports one 2.5” or 3.5” SATA Hard Drive or Solid-State Drive (SSD) with up to 6TB capacity. Simply insert the hard drive or SSD vertically into the EZ-Dock drive bay, power on the EZ-Dock, and plug to the USB port of your computer to access the drive. The EZ-Dock also supports HDD/SDD hot swap capabilities without needing to turn off the EZ-Dock or the computer. The EZ-Dock also provides LED indicators for Power status and HDD Data access. (NOTE: It is important not to unplug the drive or the EZ-Dock while the Data LED is blinking.) The EZ-Dock also comes with a One Touch Backup button which when pressed will automatically run the EZ-Dock backup software from your computer. Backup or restore your files easily with a touch of a button. (NOTE: You would need to install the PCClone EX Lite backup software first in your computer). If you have any questions about this product by Kingwin, contact us by completing and submitting the form below. If you are looking for a specif part number, please include it with your message.